A new trailer for Marc Forster's Word War Z has premiered online along with a new poster. Featuring a ton of new action packed footage and a focus on the end of the world and Brad Pitt's family values, I think it's safe to say that World War Z will be a box office smash. 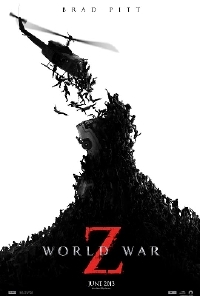 World War Z stars Brad Pitt, Mireille Enos, Daniella Kertesz , James Badge Dale, Matthew Fox Matthew and was written for the screen by Michael Carnahan.